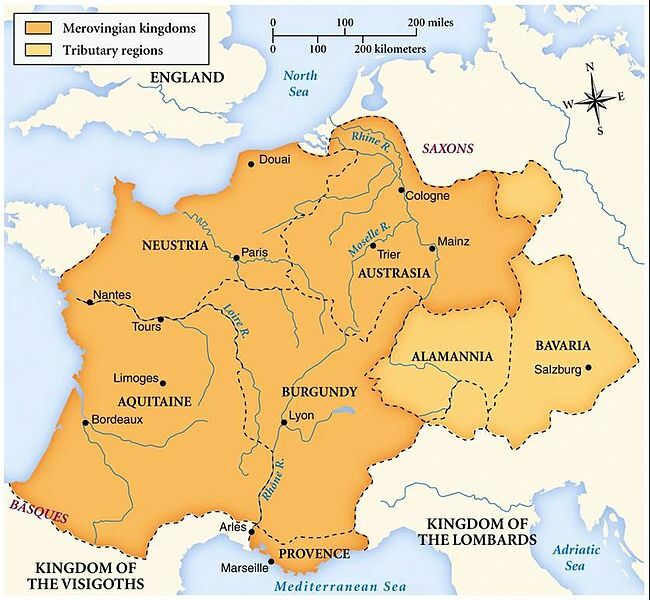 The Frankish kingdom was elective, but the election of the king was limited to the Merovingian dynasty. Since there was no distinction between state property and the property of the king, the Merovingian kings deemed the whole kingdom as their personal possession. According to this, the kingdom would be divided between the sons of the king when the father dies. Such patrimonial views of the monarchical system would especially be apparent in 511 after the death of Clovis, when the kingdom was divided into four parts, which was granted to four sons: Theuderic I (511 – 534) became the king of Austrasia (the valley of the Rhine), Chlodomer (511 – 524) ruled Orleans and Aquitaine, Childebert I (511 – 558) was crowned the king of Paris and Clothar I (511 – 561) ruled Neustria (the northern part of Gaul). Each of these kings ruled independently from his own capital. Naturally, there were circumstances when they cooperated, for example in 534 when they conquered Burgundy or 536 when they conquered Provence and the port of Marseilles. Clothar I, the youngest son of Clovis, who was successful in the unification of the Frankish state in 558, died in 561. He was succeeded by four sons: Sigebert I (561 – 575), Chilperic I (561 – 584), Charibert I (561 – 567) and Guntram (561 – 592). Sigebert ruled Austrasia (the Rhine valley), Chilperic was the king of Neustria (northern Gaul), Charibert ruled Paris while Guntram ruled Burgundy (the Rhone valley). The rule of these brothers, as well as the rule of their successors, was marked by a deep crisis, which culminated in the so called war of the two queens. The war of the two queens was preceded by the political marriages of Sigebert and Chilperic. They married Visigoth princesses, which were sisters. Sigebert married Brunhilda, and Chilperic married Galswintha. Chilperic soon lost interest in his wife, sent her away and married Fredegund, his maid servant. Fredegund ordered the murder of Galswintha, to show her influence. Brunhilda declared war on Chilperic and Fredegunda to avenger her sister. The war which is known as the war of the two queens broke out in 573. The war of the two queens was actually a war of two Frankish states, Austrasia and Neustria. These two regions were different in their ethnic composition and economy. The population of Austrasia was predominately Germanic, eastern Frankish. Neustria was inhabited by a mixed Germanic and Gallo-Roman population. In Austrasia the small fiefs of the freeman were preserved, while Neustria had a system of great landowners. The war continued even after their husbands died. Sigebert died in 575, and he was succeeded by his son Childebert II (575 – 595). In spite of this, his mother was the de facto ruler, since he was not of age at the time of his father’s death. Brunhilda continued with the war against Neustria, but she was also struggling against the separatism of the local aristocracy. This mutual interest strengthened her ties with Guntram, the king of Burgundy, who was also having certain difficulties with the local lords. Therefore they signed the treaty of Andelot in 587. This treaty regulated an “everlasting friendship” of the two kings, succession if one them would fail to produce a suitable heir, the treaty defined the borders of the two kingdoms, and they vowed to help each other against insubordinate and rebelling lords. Guntram died in 592 without a suitable heir. Chidebert II became the king of Burgundy according to the treaty of Andelot. But he also died in 595, so Burgundy and Austrasia were ruled by Brunhilda, who was reigning in the name of her grandsons. She continued the war with Neustria, which was under the rule of Fredegund and her son Chlothar II (584 – 629), the son of Chilperic. She was waging war on the local aristocracy, building roads, improving the economy, and corresponding with the pope Gregorius the first (590 – 604); all this was done to strengthen her rule but she was executed in 613 by the local aristocracy. The leaders of the conspiracy were Pepin of Landen, the majordomo (manager of the household) of the Austrasian court and Arnulf, the bishop of Metz. They accused Brunhilda for the murder of ten Merovingians. She was tortured for three days after her conviction, and then brutally executed – she was tied to two horses and ripped apart. The war of the two queens ended with her death in 613 AD. Clothar the second, the son of Chilperic, was the only surviving member of the Merovingian dynasty after the war of the two queens. He united the Frankish state under his rule, but his rule was dependent on the local aristocracy. 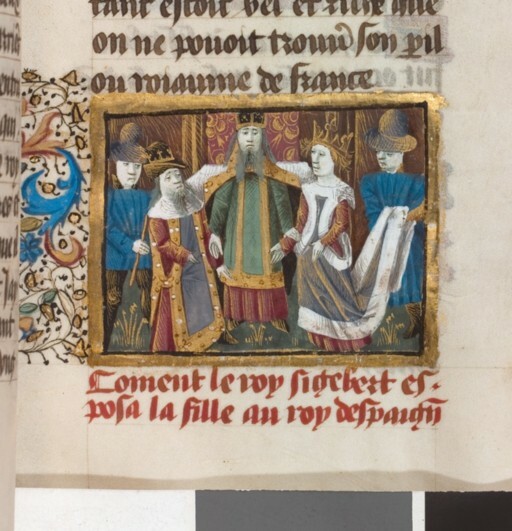 Clothar II was forced to call a council of the worldly and spiritual leaders in Paris in 614; there he conceded many rights to the aristocracy. For example: gifts in land that were promised by former kings were granted to the leudes; the lords of certain regions would be taken out of the ranks of the local landowners; the bishops were not appointed by the king, but by the priests and believers; only the bishop had jurisdiction over the priests and so on. By the end of the council the humiliated king proclaimed that he repents for all the failures of his predecessors and that similar things will not happen in the future. Clothar II named Dagobert I, his son, the king of Austrasia in 622, in an attempt to preserve the rights of kingship. Dagobert I, the son of Clothar the second, was the last Merovingian king who had control over the entire Frank kingdom. Dagobert I continued with the active foreign policy of his father. In his time the Franks of Austrasia were defeated by the Slav ruler Samo (626 – 658). The Slavs (Veneti) were a threat to Austrasia around 630, and the Austrasians were unsuccessful in their attempts to face them. The Saxons offered military assistance if the Franks would reconsider the tribute the Saxons had to pay to Austrasia (500 cows). Dagobert I accepted, but he had no further success in the war against the Slavs. The Frank king would later wage war against the Saxons too, which were defeated. Although the Saxons promised that they would pay the yearly tribute, they never did. Dagobert faced another threat, the Basques, who were pushed out of the Iberian peninsula by the Visigoth king Liuvigild in 585. They were endangering Aquitania, which was a region of the Frankish kingdom from 507. The Basques were defeated by Dagobert in 635, but this defeat was not enough to suppress their advances. The peace agreement with Byzantium (“eternal peace”) is regarded as his greatest diplomatic success. In an attempt to preserve the institution and rights of the king, Dagobert named his son Sigebert III as the king of Austrasia. Dagobert moved to Neustria. The chronicle of Fredegar mentions that the population of Austrasia was so distressed that Dagobert is leaving that their morale suffered and that they were defeated by Samo due to that. Samo remained undefeated until his death in 658. Dagobert died in 638. He was the first Merovingian ruler who was buried in the basilica Saint Denis, which was expanded and richly decorated during his reign. Dagobert was succeeded by two sons: Sigebert III (634 – 656) and Clovis II (638 – 657). Sigebert was named the king of Austrasia in 634, and Clovis became the king of Neustria and Burgundy in 638. The rise of the majordomos is already evident during their reign. Sigebert III died in 656, and the majordomo Grimoald (643 – 657), the son of Pepin of Landen, exiled the son of Sigebert, the legitimate heir, and named his own son Childebert “the adopted” king in 662. Chlothar III (657 – 673), the king of Neustria, attacked Austrasia and executed the usurper Childebert, and named his younger brother Childeric II (662 – 675) as the king. Now Chlothar III was ruling in Neustria and Burgundy, while his younger brother Childeric ruled over Austrasia. Chlothar the third died in 673. Majordomo Ebroin (656 – 683) planned on naming Theuderic III as king. The aristocracy was opposing strong kings in the past, but they were also against the rising might of the majordomos. A conspiracy was forged against majordomo Ebroin in 673, Childeric II, the king of Austrasia, was named the king of Neustria and Burgundy. But Childeric II was also in support of a strengthened institution of kingship. The aristocracy was forced to remove Childeric II in yet another conspiracy in 675. Childeric II was the last Merovingian king who strived to strengthen the institution and rights of the king. The age after his deposal is the time of the weak kings and strong majordomos. Theuderic III (675 – 691) was named king of Neustria and Burgundy after the assassination of Childeric the second. The throne of Austrasia was granted to Dagobert II (675 – 679). Theuderic III became the Frankish king after the death of Dagobert, but he had practically no influence. Neustria was ruled by majordomo Ebroin, and Austrasia was in the hands of the majordomo Pepin of Heristal (675 – 614), a descendant of Pepin of Landen. Ebroin and Pepin had the same goals, to unite Austrasia, Neustria and Burgundy under their rule. After the battle of Tertry (687), the kingdom was united by the majordomo of Austrasia under the formal rule of Theuderic the third. The war of the majordomos strengthened the separatist notions in Provence, Aquitaine and Burgundy. In the future Pepin of Heristal and his descendants would have great difficulty with these separatist tensions. Pepin of Heristal was succeeded by Charles Martel in 714, who would be the founder of a new ruling Carolingian dynasty. 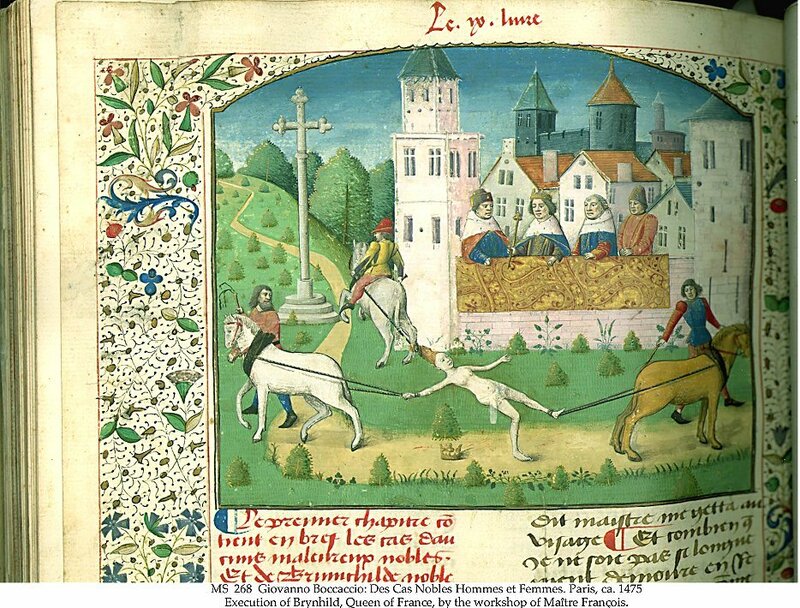 Next articleHow Medieval European cities started to develop?